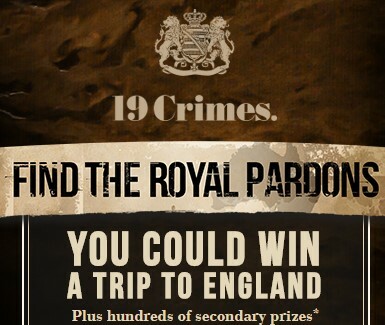 Enter this instant win game and sweepstakes for your chance to win great 19 Crimes branded prizes or iTunes gift cards instantly or a trip to ENGLAND worth over $7000! SWEEPSTAKES PRIZES: (6 total; 1 for the National Sweepstakes and 1 for each of the 5 Regional Sweepstakes [1 per Keyword]): The National Sweepstakes prize winner and each of the Regional Sweepstakes Prize winners will receive a seven (7)-day/six (6)-night trip for the winner to London, England (“Sweepstakes Prize”). Each Sweepstakes Prize includes round-trip coach class air transportation from a major commercial airport near winner’s residence to London, England for winner; six (6) nights hotel standard accommodations (single room/occupancy); tours of the Tower of London and the London Dungeon; and a $1,000 check made payable to the winner. The (ARV”) of each Sweepstakes Prize is $7,328. HINT: You can get codes FREE online from October 18th through the end of the Instant Win Game & Sweepstakes. See the official rules for details.